Sunday 2nd September 2018, ko 1:30pm. Mesut Ozil is set to return for Arsenal after illness as the Gunners travel to Cardiff in the Premier League. The 29-year-old midfielder missed last weekend's win over West Ham but has trained all week and is back in contention for a starting spot. Elsewhere for Arsenal, Laurent Koscielny (Achilles), Sead Kolasinac (knee), Ainsley Maitland-Niles (leg) and Carl Jenkinson (ankle) are missing, as Lucas Torreira pushes for his first start. Cardiff have injury problems. Nathaniel Mendez-Laing has been ruled out for three months after damaging knee ligaments, and Junior Hoilett faces a fitness test on a groin injury that has sidelined him for two weeks. Aron Gunnarsson will not return until after the international break because of a knee injury that has ended his hopes of linking up with Iceland following the Arsenal game. Cardiff manager Neil Warnock insists he will not be suffering any sleepless nights just because his goal-shy side's next three opponents are Arsenal, Chelsea and Manchester City. "You say three. I'd say 33," Warnock replied when asked about Cardiff's tough run at his pre-match press conference. "You are looking at the teams, but if you'd let it worry you too much you'd never sleep at night. "We've got to look at this as a challenge to try and create chances against the top teams. We know they will have a lot of possession and it won't be all down to us parking the bus, because these teams have great quality. "But it could be worse, we could be in the Sky Bet Championship going all over the country. I'm definitely going to enjoy going to these stadiums and, at my age, I want to see my team playing good football." ‘I prefer to play the game as it should be played, but you also have to adapt. I play to win every match, certainly to improve our away record. ‘Now we are going to play against Cardiff away and for that my thoughts are only on how we can win. Then it’s not to think about the past. Cardiff are winless in their last 13 games against Arsenal in all competitions (D5 L8), since a 3-2 away win in February 1961. 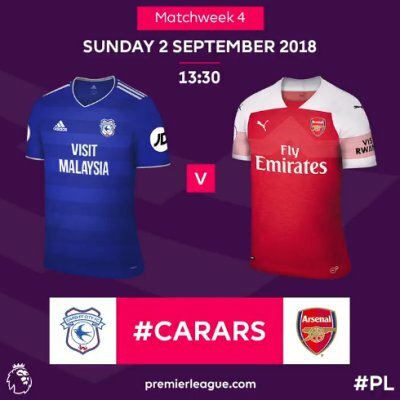 Arsenal won both previous Premier League meetings with Cardiff back in 2013-14, including a 3-0 triumph at the Cardiff City Stadium. Four of Arsenal's five Premier League goals against Cardiff have come in the final five minutes of games. Since Sean Morrison scored Cardiff's second goal against Hull City in April, the Bluebirds have failed to score with any of their 55 shots in league competition and are goalless in four league matches, their worst run since March 2014. Cardiff are yet to play a single Welshman in the Premier League this season, giving 1,358 minutes to Englishmen, while opponents Arsenal - who are one of six clubs to have used a Welsh player this season (Aaron Ramsey) - have given fewer minutes to English players than any other side (50). Matteo Guendouzi could become only the fourth teenager to start each of Arsenal's first four matches of a Premier League season, after Nicolas Anelka (1998-99), Cesc Fabregas (2004-05 and 2006-07) and Johan Djourou (2006-07). Since scoring from a corner against West Ham in April, each of Arsenal's last 16 Premier League goals have all come from open play.